I'd like to reserve 2 pack backs. You can reserve backpacks by clicking on the link in the first sentence of this post. Hi there. You can reserve backpacks by clicking on the link in the first sentence of this post. Thanks! People aren't seeing the link to click and reserve their pass, because the link is in very light green. Your webmaster should change the hyperlinked words "clicking here" to a much more visible color, and make them BOLD, also. Good call. I made it bold. Good call. I made it bold. Thanks. The link says unavailable, is this offer no longer going on? If so then the webmaster should take this info down to ease confusion. Hi there. You may have tried to access it while our Catalog is performing maintenance tasks in the early morning hours. Please try again perhaps at a different time. Thanks! Very long wait list...are you getting more packs? So I reserved my pack, which I think is a super wonderful idea...but I am 259th in the wait list! At a checkout rate of 1 week per patron, I will get a chance to get the pack in about 5 years. Are there plans to add more packs to shorten up the wait times? Hi Tammy! Thank you for contacting the library! 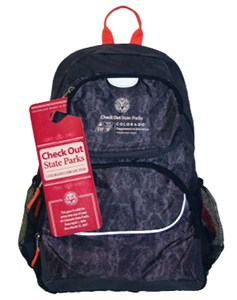 Unfortunately, we are not able to add more packs or passes to our circulating collection per our partnership with Colorado State Library and Colorado State Parks. However, State Parks are always available to visit for a fee ranging from $7-9 per vehicle daily, which funds the use of these areas (https://cpw.state.co.us/Documents/About/Reports/StatewideFactSheet.pdf). Check the website of the State Park you are interested in visiting for potential deals or discounts. We apologize for the long waiting period, but appreciate your support and patience. Have a wonderful summer, and please let us know if we can assist you with anything else! Hi there. Please click on the link in the first sentence of this page to place one on hold.